It is one of the homemaker's great privileges and duties to provide her family with delicious and nutritious meals. I like to include as much homemade broth in our diet as possible, as it's so healthful! So therefore I'm making lots of soups! Fall is the perfect time to begin incorporating delicious soups into your family's diet. I have been making good use of my crockpots to make soup almost every day. I love that we can get almost all of our food groups in one dish, which makes my job much easier. Put everything in a pot and then you have a yummy meal ready for you at the end of the day! We usually eat our soup with homemade bread and/or a salad. Make different kinds of bread for variety! Lately we have been having yoghurt herb bread or corn bread with a nice slab of butter. In my search to find slow cooker soup recipes, I found this site (Crockpot 365) which has lots of crockpot recipes. We have tried several of the soup recipes there. Some we didn't like, but several we did. A few of our favorites are Pesto Minestrone Soup, CrockPot Pizza Soup, CrockPot Chicken and Rice Soup, and Crockpot Broccoli and Three Cheese Soup. What's really neat is that there is a blue "Save Recipe" button at the end of each recipe that allows you to store the ones you'd like to try at ziplist.com (or right on the crockpot365 site.) It also allows you to print off your recipe, and it also puts the ingredients into a shopping list for you. I had some functionality problems with the Ziplist tools so I use the Plan to Eat site instead for printing my shopping lists. Plan to Eat has helped me save so much time when planning my meals and making up a shopping list. You can use the site to store recipes and from them have ready-made shopping lists and easily plan your menus. 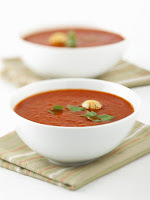 Do you have any favorite places to get soup recipes for your slow cooker? Dear Lady Violet, I just wanted to tell you how the Lord spoke to my heart yesterday while I was reading your blog. He spoke the word ladylike to my heart, and I said show me Lord. And He did! Big changes in my wardrobe, I have always been modest, but this was different. I am excited for this new way of thinking. Change my heart O God. Merry Christmas! That is wonderful, Roxy! So glad you were open to the Lord's leading. He definitely had to show me about being ladylike too, and I'm still learning. Merry Christmas and enjoy making soup! I love making home cooked meals as I know it is much healthier than anything i can buy already made. There really isn't any excuse for families not to home cook from basics as it is far cheaper than buying processed food and far more filling. And even though I work every day, I still have time each evening to prepare a yummy and healthy meal. I like to cook a big pot of stock on the weekends and yes, it does taste way better.